This article deals with step-by-step instructions on how to manually recording fees (Paypal or Square) and then match the deposit transactions in bank feed —Review items from your bank and link each item to an existing record. EXAMPLE – Signed up for Square (or PayPal) so that I could accept credit cards. I will be paying the fee myself, not the customer. So when I give a customer an Invoice for $1,000.00, they will swipe their card and have $100 taken from the customer. Square (or PayPal) will take their fee off the top and then deposit $970.00 into my business checking account. My bank feed under review items from bank link will show $970.00 deposit ($1,000 customer payment less $30 fee). 1. Identify the customer Invoices that were paid via Square or Paypal. 2. Receive Payment of open invoice amount (create “+” sign > customers > receive payment) . Select the invoices that were paid. Make sure to select “Deposit-to” that this payment is being deposited into your Undeposited Funds account. NOTE: To ensure that the associated transaction processing fee is recorded accurately, the invoice payment must be applied manually through the “Receive Payment” screen (rather than through the matching feature). A manual deposit must also be entered (step 3). 3. Add a new Deposit. Click on the Create or “+” sign and go to “Other” and click on Bank Deposit. 5. Record the processing fee part of the transaction under Add New Deposits tab. Make sure to enter the amount of the processing fee as a negative number so that it deducts from the total deposit amount. 6. Total deposit amount should match your deposit to accept the transaction in bank feed. 7. Go back to Banking and under the Dashboard, locate your deposit under “For Review” tab. 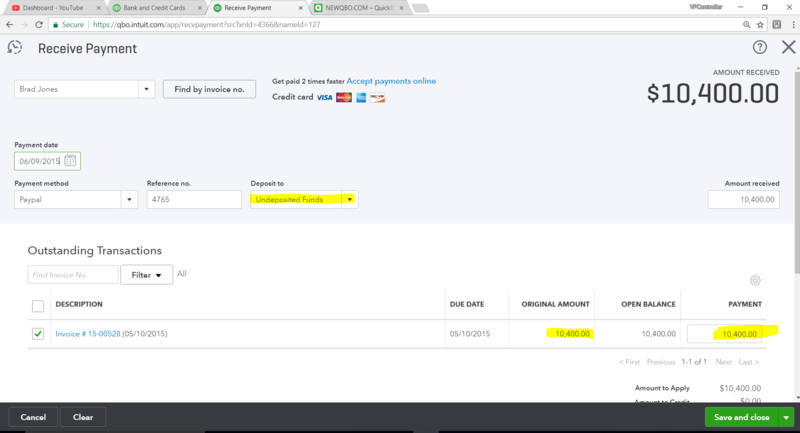 Since the processing fee has now been manually recorded in QuickBooks, you will be able to match your Square or Paypal deposit.